A newfound optimism blows in the Irish wind these days. A newfound optimism blows in the Irish wind these days. Dublin is a hip and happening place and yet while there’s a new breed of creative thinker in town, the things that make Ireland so appealing are delightfully unchanged – its raw landscapes and wild coastlines, quaint villages and country pubs, its folk music and dance and of course its whiskey – best drunk out of Waterford crystal. On arrival in Dublin you will be met by your Guardian Angel and transferred to your elegant hotel in the heart of Georgian Dublin. Embark on a city adventure beginning with the impressive Trinity College; Ireland's oldest university. Here you see the world-famous Book of Kells; a fabulous example of early Irish manuscript illumination. Hand-crafted by monks, it contains the four gospels and has been resident at Trinity College since the 17th century. Explore the Old Library, which houses 200,000 antiquarian texts and the oldest surviving harp in Ireland. Continue to St. Patrick's Cathedral, the largest church in Ireland, where you have the opportunity to see a memorial to Jonathan Swift, the author of 'Gulliver's Travels', who became Dean of St. Patrick's in 1713. Afternoon at leisure. 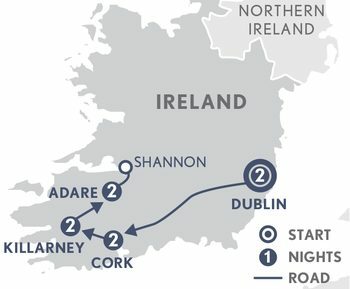 Day 3: Dublin – Waterford – Cork. This morning you head out of town to Kilkenny, Ireland's best-preserved medieval town, where you visit the castle and St. Canice's Cathedral. There’s an opportunity to also visit the renowned Kilkenny Design Centre, home to a flourishing school of pottery and textile design. Next stop Waterford City, for a tour of the Waterford Crystal Factory. This is the largest cut-glass factory in the world, producing many fine commemorative pieces every year. Discover the various processes involved from mould-making to engraving, watching master craftsmen plying their trade. Continue to Cork and your hotel. Cork is Ireland's third largest city and home to one of the best-loved covered food markets in Europe, the English market. Spend time exploring the many stalls from meat to baked goods. See St. Fin Barre's Cathedral, an impressive example of Gothic Revival architecture. From here, drive east to Cork Harbour, which is overlooked by the picturesque town of Cobh. It was here that the Titanic was last seen before its fateful maiden voyage across the Atlantic; the maritime heritage of the area is vividly portrayed in the Queenstown Story exhibition. Nearby, in Midleton, is an enormous distillery where many brands of spirit are produced, including Jameson's whiskey. At the Old Distillery, visit the heritage centre where the process of producing Irish whiskey is explained. Day 5: Cork – Killarney. Journey into the region known as West Cork. The route takes you via the picturesque town of Kinsale, well known for its quaint streets and seafood restaurants. Continue along the coast road though Clonakilty and Skibbereen, eventually reaching Bantry Bay. Later, at Glengarriff, board a small boat that takes you to Garinish Island, home to the famous sub-tropical gardens of Ilnacullin. Spend time here admiring the Italian-style garden where a wide variety of shrubs and plants have been cultivated using the warming influence of the Gulf Stream. Return to the mainland and drive over the very picturesque Caha Mountains that form the heart of the Beara peninsula. Then drive through the wild and windswept landscape following the waters of the River Sheen on to your next hotel. This evening, you are welcomed into the home of a local family. Nothing brings people together more than sitting down to a home cooked meal and this is your chance to experience a traditional Irish dinner with your hosts in a relaxed and friendly atmosphere. Later, you may be joined by other family members who further add to the merriment and engaging conversation. As the evening draws to a close return to your hotel with a lasting memory of your visit to Ireland. Day 6: Ring of Kerry. Explore the Ring of Kerry today, one of the best-loved coastal drives in Europe. The road follows the shoreline of the Iveragh Peninsula, passing some of the most beautiful mountain and moorland scenery in the whole of Ireland. To the south of Portmagee runs the Ring of Skellig, a quiet, scenic, though often steep, route around the most westerly point of the Iveragh Peninsula, via wild and exposed St Finian's Bay. This is the unlikely home of the small but high-quality, family run Skelligs Chocolate Factory where you may wish to enjoy a sample or two and watch the chocolates being made in their 'open plan' production area. From the highest point of the road between Portmagee and St Finian's Bay, you can climb the hill for the most magnificent views out to the Skellig Islands, across to the Dingle Peninsula and the Blaskets and inland to the Iveragh Mountains. Day 7: Killarney – Dingle - Foynes – Adare. Follow the shore of the Dingle Peninsula until you reach Dingle Town, a long-established fishing community. You then take the Slea Head drive that leads to the westernmost tip of mainland Ireland, for excellent views of the Blasket Islands from the road that hugs the clifftops. Learn about the culture and heritage of this Gaelic-speaking region at the Blasket Islands Heritage Centre. Continue your journey along the estuary of the River Shannon, the longest in the British Isles, and enjoy a stop in Foynes famed for its Irish coffee legacy. In 1942, Joe Sheridan decided that transatlantic passengers needed something stronger than ordinary coffee to revive them after the flight, and so introduced the original Irish coffee. Learn how to make it in a master class using Irish whiskey and fresh local cream. Your final day in Ireland is at leisure. Take a stroll into the charming village of Adare with its thatched cottages, quaint coffee shops and antique shops. Relax in the Spa at the hotel or take part in some of their activities, like falconry or archery (payable locally). Day 9: Adare - Shannon. Your journey ends with a private car transfer to Shannon Airport.